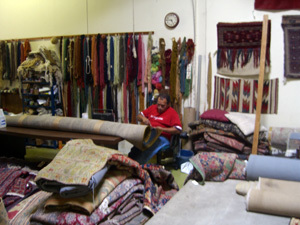 We are located in Rockville, Maryland, and provide oriental rug cleaning in Maryland as well as oriental carpet restoration with pickup and delivery service 50 miles around our Rockville Maryland showroom including Baltimore, Frederick, Howard County, Annapolis in Anne Arundel County as well as Loudoun County, Arlington and more in Northern VA. The business started in Iran in 1924 and then opened a branch in Germany before moving to the United States. We will professionally treat your Oriental Rugs at our Maryland location for: Pet Stains, Water Damage, Discoloration, Moth Damage, Binding & Fringe, and Holes & Tears. Pet Urine Removal from Oriental Rugs: if required your rug will be treated for pet urine before our hand washing.